MSK Ultrasound is generally not of great use in the Emergency Department UNLESS you are suspicious of a quadriceps / patellar tendon injury with ambiguous other objective findings. MSK Ultrasound cannot adequately image the menisci or cruciate ligaments, and while they can visualise the collateral ligaments, clinical assessment can give this information (and more) and even substantial damage to the collateral ligaments would not necessitate urgent surgery. The Well's criteria is a tool which can be used to predict DVT and determine further investigation. Those with Wells scores of two or more have a 28% chance of having DVT, those with a lower score have 6% odds. Alternatively, Wells scores can be categorized as high if greater than two, moderate if one or two, and low if less than one, with likelihoods of 53%, 17%, and 5%, respectively. MRI is useful for imaging significant soft tissue injuries which may require prompt attention as well, such as a grossly unstable knee. Stable, undisplaced and minimally displaced fractures of the patella are managed in a Zimmer Splint for approximately 6 weeks, keeping the knee completely straight. 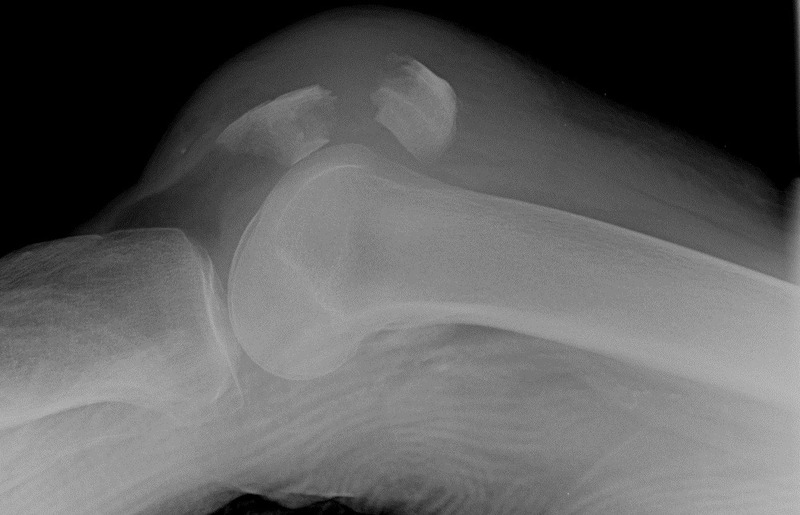 Displaced patella fractures require operative management. A Segond fracture is a small avulsion type fracture of the lateral aspect of the tibial plateau where the lateral capsular ligament avulses a fragment of bone. It is NOT from the Lateral Collateral Ligament, which attaches to the fibular head. 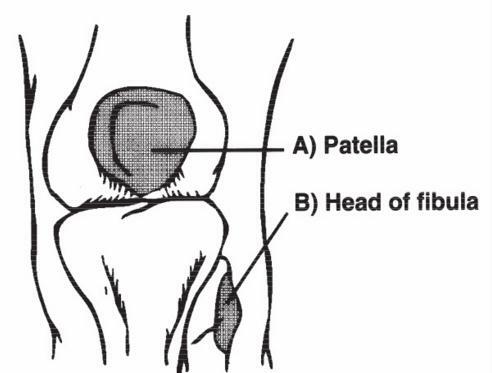 In the skeletally immature patient, the tibial tubercle may be avulsed by the pull of the patella tendon. This is usually the culmination of repeated trauma and the patient will often have a history of Osgood Schlatter’s “disease”. In this film, the ACL has avulsed the anterior tibial spine. Note the presence of a lipohaemarthrosis on the Horizontal Beam view. 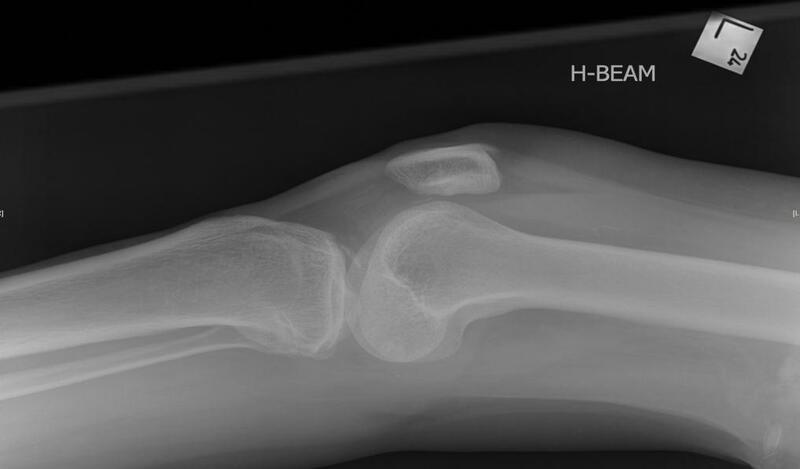 Fat visible on x-ray usually indicates fracture. The five causes of a haemarthrosis are intra-articular fracture, ACL rupture, PCL rupture, meniscal tear and PFJ dislocation. Management usually entails surgery unless undisplaced. Tibial plateau fractures vary significantly in their appearance. 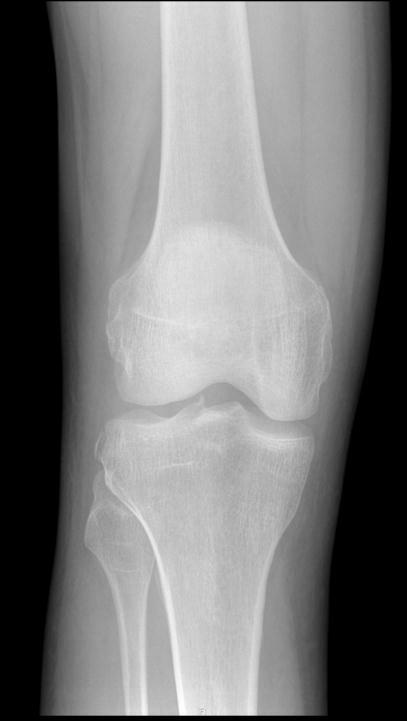 This film shows an obviously displaced tibial plateau fracture which requires ORIF, however these are often subtle, with varying amounts of depression seen on AP films. 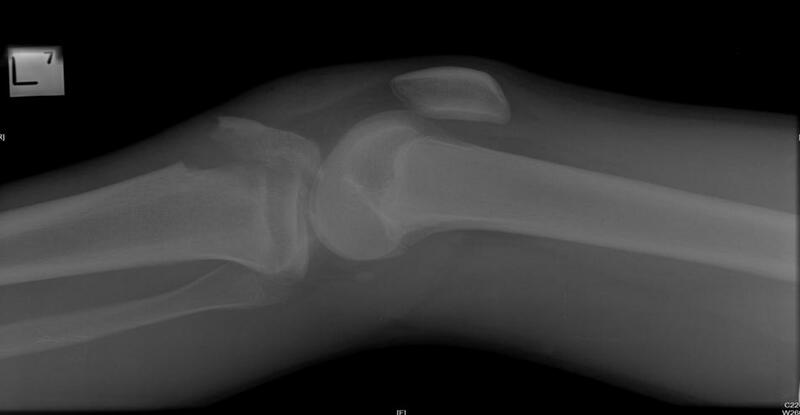 Depressed fracture of the medial tibial plateau, also requiring ORIF. 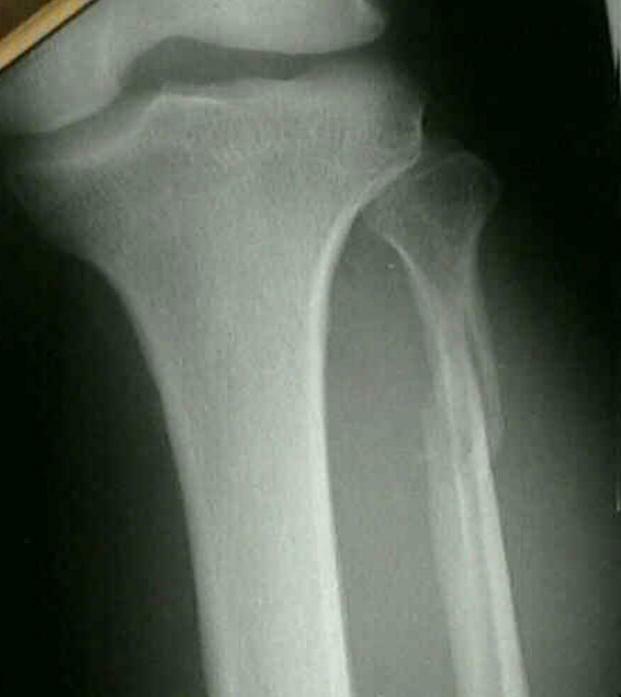 The Maisonneuve fracture is a spiral fracture of the upper third of the fibula associated with a tear of the distal tibiofibular syndesmosis and the interosseous membrane. There is an associated fracture of the medial malleolus or rupture of the deep deltoid ligament. 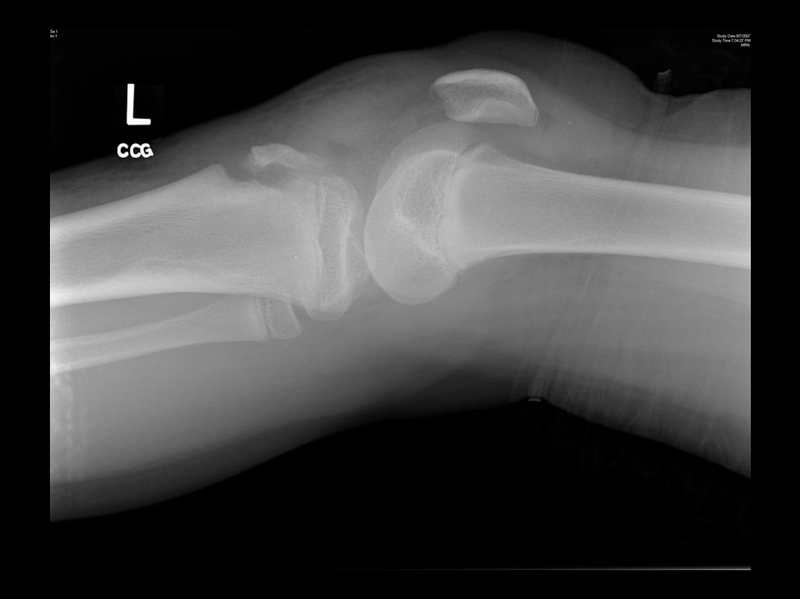 In contrast, an isolated fibular neck fracture associated with a direct blow is often managed symptomatically.